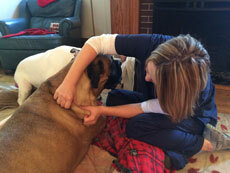 Wholistic Paws offers state of the art, integrative therapies to help give your companion a new leash on life! Throughout history, massage has proven to have many benefits in physical and psychological health for both humans and animals. For our pets to age gracefully, it is essential to maintain both strength and flexibility of their muscles and joints. The ability to enjoy playing and engage in daily activities measures up to happiness and overall well-being. Providing our pets with a beneficial therapy such as massage not only strengthens the bond between the parent and pet, but helps them maintain a level of comfort throughout their younger years and into the later stages of life. Will my pet tolerate or enjoy a massage? Who can massage my pet? Used to promote overall well-being, increase comfort and improve quality of life. This type of massage greatly contributes to relaxing the body, improving circulation, relieves muscle tension and improves range of motion. Used mainly for athletes or working canines, sports massage is generally performed during pre-event and post-event sports. The pre-event massage is an energizing massage that warms the muscles, increases flexibility and prepares the muscles for exercise. It is especially useful for helping to prevent injury. Post-event massage loosens up muscles, aides in removal of toxins (lactic acid) and facilitates a quicker recovery. Typically used for pain relief, this is a more site specific massage for muscle aches and pains that lie deep within the muscle layers. This massage technique can be used in sports massage and therapeutic massage or as a stand-alone massage therapy. Most pets enjoy massage. It is common that during the first session or even the first few minutes of the massage, your pet may be a little restless or guarded because they are uncertain of what you or the practitioner is doing. It is very important for the therapist to set the stage for the massage (a quiet room, comfortable mat or bedding). This also means that the therapist sets their intentions and goals of performing the massage to the pet. The therapist must calm their mind and be ready to connect with the pet during the massage. Never give a massage if you are too busy, rushed or pre-occupied by stress or anxiety, your pet will pick up on your tension and the massage will not be comforting or beneficial to you or your pet. During a massage session, the therapist will discuss physical history of your pet, emotional history, present illness or sensitive areas and present behavior. The therapist will then perform an overall evaluation of the pet, checking for areas of pain, swelling, imbalances, cold or warm areas, and lack of tone, tension or spasms. Then as the session begins, your pet may initially want to stand or sit until they get comfortable with the touch. 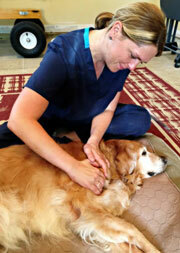 Soothing strokes will help calm your pet and set the intent for the rest of the massage. The time of the massage session will be determined by the condition, age and comfort level of your pet. Massage session can be performed at home by the parent; however we encourage you to learn basic massage techniques from a certified canine massage therapist. At this time, there are no laws governing who can provide massage therapy for pets. Ideally, a massage practitioner will have completed certification through a school of animal massage such as the Rocky Mountain School of Acupressure and Massage. At Wholistic Paws Veterinary Services, we are fortunate to have Kasey Braun, LVT, CCRP, CTMT on staff who can combine her many years of pet rehabilitation expertise along with her massage training to help you and your pet!